The rainy weather is keeping us inside, and we are searching for things to do. We decided to work on our numbers and counting using a few rain themed math activities. Plus, it's been awhile since I've linked up to Math Box (formerly Math Monday). The weekly blog hop has a new host, love2learn2day, so be sure to take a peek at all the kids' math activities posted on the informative site. Musings of Me offers wonderful and free printable resources for young learners. I adore her new spring printable, The Colors of my Umbrella. The printable teaches colors and numbers up to ten and also includes a writing activity. My daughter pretended to be a teacher and helped my son determine what color to make each umbrella. 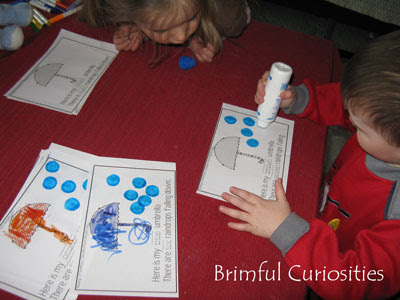 She also helped him use a paint dobber to apply the correct number of raindrops on each page. She practiced writing her numbers by numbering all the raindrops and read the book aloud to everyone after we stapled all the pages together. My son is very proud of his artwork and likes to practice counting to ten using this book. I was delighted that my kids could work together on this project without much assistance. 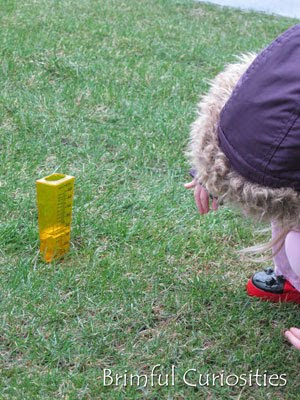 Kids can easily learn how to read rain measurements using a rain gauge. Our gauge is calibrated in inches and centimeters. My daughter determined that 1.7 inches of rain fell (though I'm not sure when the gauge was last emptied)! In May we're planning to chart the daily precipitation. We'll post our findings in another Math Box post after we're finished with the activity. Don't have a rain gauge? You can make your own. Scholastic has a neat Make a Rain Gauge printable activity. And, if your kids are budding meteorologists, consider printing out the My Weather Wheel: Pattern also at Scholastic Printables. "Let the rain kiss you. Let the rain beat upon your head with silver liquid drops. Let the rain sing you a lullaby. ..."
"It’s raining in the city. I hope it rains for hours. Come look out my window! Tilt to read the signs. ..."
also - i have two poetry posts to link up, but some camera issues are rendering me helpless at present. boo! I always love how you pull so many different resources in your posts. It's nice that your daughter is able and willing to teach her brother!